Metro’s Silver Line will at long last begin service on Saturday, July 26, Metro officials said on Monday. Metro General Manager and CEO Richard Sarles says he is satisfied with the progress contractor Bechtel has made in fixing remaining issues, and the 11-mile extension from East Falls Church to Reston’s Wiehle-Avenue will soon be open for business. MWAA still needs to obtain Certificates of Occupancy from the commonwealth as well as some final test results, said Sarles. There will also be a public safety drill at the Spring Hill Station this weekend and a week of simulated service beginning July 20. Metro will host an inaugural ceremony on July 26. All five stations will be open, and the first passengers will leave Wiehle-Reston East at noon that day, Metro officials said. The wait has been a long one for area Metro riders. Work began on Phase 1 of the rail extension more than five years ago. This is Metro’s first new line since 1991. While no official opening date was ever set, initial forecasts were for the Silver Line to open in late 2013 or January of 2014. However, construction delays and issues have pushed it back more than six months. As recently as two weeks ago, Metro officials were saying they were disappointed in the progress that Dulles Transit Partners, the Bechtel division that built Phase 1, were making in completing a list of remaining fixes on the $2.9 billion Phase 1. Sarles said on Monday that it has cost Metro “$2 to $3 million a month” in lost revenue since January. Metro took control of the Silver Line May 27, starting a 90-day testing and training period. However, MWAA and Metro agreed in April that certain items could be completed after the handover but before passenger service begins. With work finally complete, Reston will finally be connected with downtown D.C. via rail. Wiehle-Reston East will be the end of the Silver Line for at least five years. Phase 2 is expected to be complete in 2018, taking passengers to Reston Parkway, Herndon, Route 28, Dulles International Airport and Ashburn. Wiehle-Reston East is also the only Phase 1 stop with parking. There are 3,300 spots in the Reston Station garage, which was jointly built by Fairfax County and Comstock. While roads near Sunset Hills Road and Wiehle Avenue, where Wiehle-Reston East is located, have been widened and improved and connector bus routes rerouted, traffic in the station area is expected to increase as thousands of commuters in cars will head to Reston to park and board the Metro. The ride from Reston to downtown is expected to take about 40 minutes. To see your exact travel time and fare, visit the Silver Line’s online calculator. 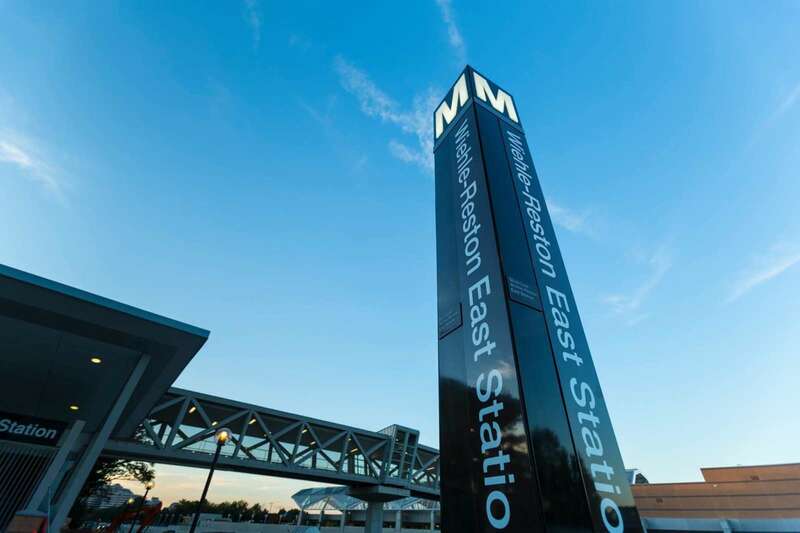 Metro estimates that 50,000 passenger trips each weekday will start or end at the five Silver Line stations, with Wiehle-Reston East expected to be the busiest. Rep. Gerry Connolly (D-Va. 11) was among the local leaders expressing excitement over the announcement on Monday. “”Fifty-two years in the making, since the first proposal to connect Dulles Airport with downtown Washington appeared in a 1962 regional transportation study, the opening of the Silver Line will have a transformative effect on our region,” he said. Connolly said he, like many area residents, was frustrated by the months of delays to get to this point. He also said he will ride the rail on July 26. Photo of Wiehle-Reston East Metro Station courtesy of Fairfax County.